We reported the imminent launch of the first Couach 5000 Fly, and as scheduled the 49.9m superyacht La Pellegrina hit the water over the weekend. La Pellegrina is not only the largest yacht built by CNC, but also the largest composite (kevlar carbon) yacht ever built in France. Designed by CNC's in-house team, she has interior design by Jean-Pierre Fantini and accommodates 12 guests in a master, VIP, two double and two twin cabins, plus a crew of 10. She is powered by twin 5,300hp MTU engines giving her a maximum speed of 28 knots, a cruising speed of 25 knots and a transatlantic range. 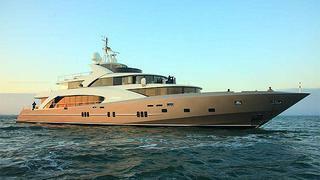 La Pellegrina will be delivered to her owners during a special Couach event at Saint-Tropez harbour in May. She will also appear at the next Monaco Yacht Show. CNC has confirmed that it will launch the second hull in 2014.